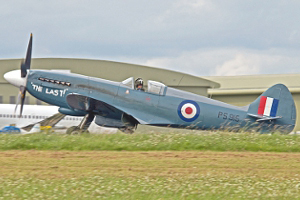 CHANGE OF FORMAT AT KEMBLE – GOOD THING OR BAD? 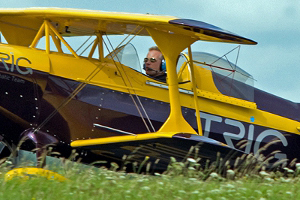 The original air show, at Kemble, was cancelled and then replaced by a new format – “The Best of British”. 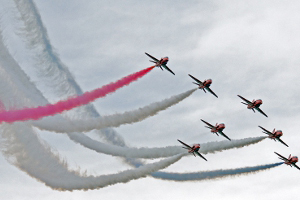 Whilst this may achieve the aim of promoting involvement by local businesses and commerce in the area, it has meant that the air display seems to have become a less important component part of the event. In these challenging economic times, a boost for the local economy is welcome. 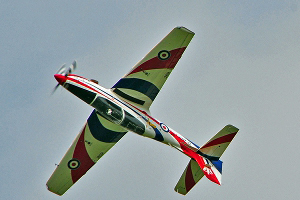 Having attended the last 2 years at the show, I would suggest that the attendance figures were well up on previous years but, it was apparent that there was a lack of aviation enthusiasts and the “long lens photo brigade” certainly seemed to have given the show a miss this year. I teamed up with another freelance photographer and enjoyed the very welcome hospitality provided for the media by the organisers. 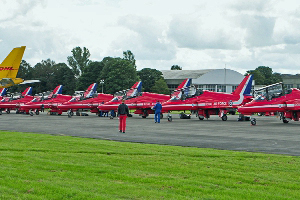 Whilst the organisers seemed to have a long list of media guests, the flightline location was never crowded and so I would assume that media coverage was concentrated on other areas of the show. 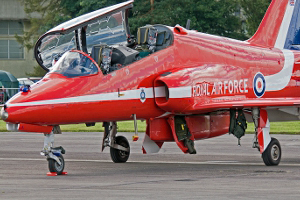 There was no Kemble “fly in” this year and the aircraft type list was sparse – had the Red Arrows not returned to their traditional Kemble home for this event, there would have been very little for air show goers to watch. The Arrows were operating out of Kemble so, at least, their departures and returns, from other shows, resulted in some plane movements throughout the day. 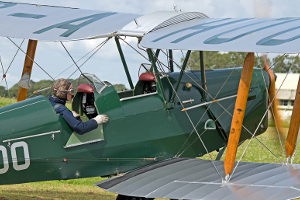 I do not want to be unduly critical of the hard work by the Organisers, but my main brief is to review the airshow aspect for Airscene readers and not pass detailed comment on other commercial aspects of the show. 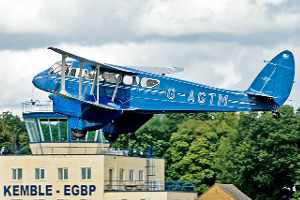 However, I can say that the organisation was excellent and the new features and actvities may not suit the plane enthusiast but would certainly provide an enjoyable family day out. Catering facilities were plentiful but perhaps a little expensive. 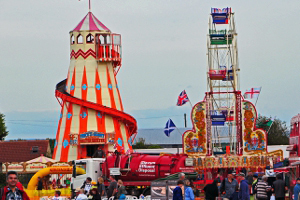 The introduction of a stage and live music was a welcome addition to most – especially with the Three Belles providing some nostalgia with songs from the 40’s era. The problem was, however, that their very professional act would have had more relevance had the air show included some P51’s and aircraft like the B17 Sally B! 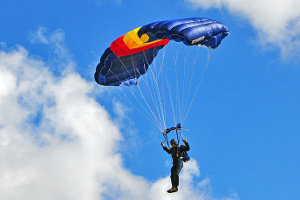 The air display began with the Skydiving – which seems to becoming a regular part of the air show circuit. 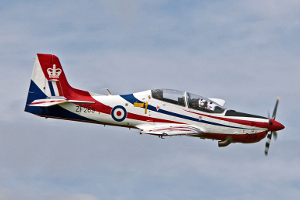 We were treated to displays by the Tocano and the Hawk Trainers. 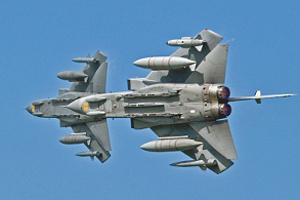 Despite the reduction in aircraft attending, the display by the Tornado Demonstration Pair was excellent and the use of impressive pyrotechnics with a percussive feel factor, produced an impressive and realistic mission scenario. 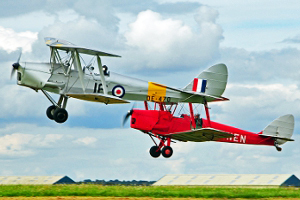 An interesting display from 8 Tiger Moths flying in formation and which also included “squadron” takeoffs, brought back the sights and sounds of the 1930’s – and, even after 70 years, there is still life in these iconic bi-planes. 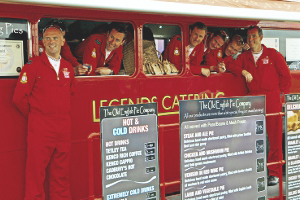 In between “missions” the Red Arrows were on continuous PR duty across the site and rarely stopped working – even for lunch. Though, how a pilot can eat a large baguette 20 minutes before subjecting his stomach to a gut wrenching 9G is beyond me, and most other people, I would think! 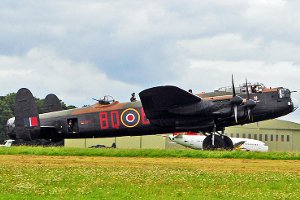 Of course, their display was immaculate and with a fairly high cloud base, we were treated to the full version. I have seen the Arrows a lot of times during what has been a difficult season for them – I can say that this was the “tightest” performance I have seen them fly this year. The Trig Team displayed with the usual panache and noise but seemed to be losing the battle against the stage show and, the rather attractive, Three Belles! The Battle of Britain Memorial Flight had arrived earlier, almost unnoticed, and finished off the air display with their usual, nostalgic routine. So, what do we conclude from the change of format? Kemble provided nothing unusual so far as the air display went. 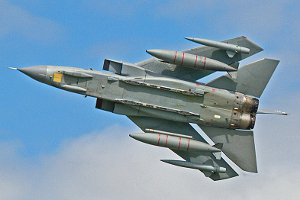 Too few aircraft and long gaps in displays do not sit well with plane enthusiasts. 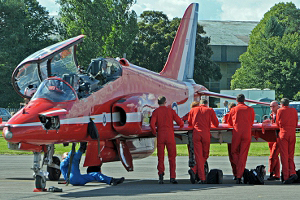 The Red Arrows Team work exceptionally hard both with their flying and with their PR Duties but, even they, cannot make up for the massive reduction in the numbers of aircraft attending. 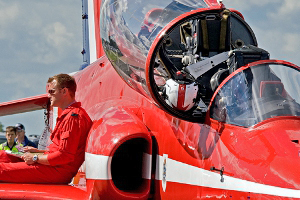 Kemble is a good choice if your “better half” complains that you spend too much time at air shows – you could, at least, go to this event, and still get to sneak in some plane watching. But, if you are a serious enthusiast, there would be little to thrill or excite you. 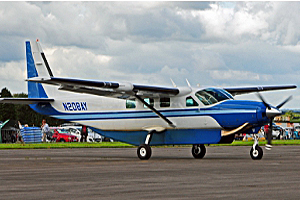 I don’t know what the intention is – if there is any further reduction in flying programs, Kemble will cease to be of any real interest to any of us. 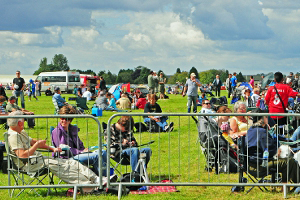 If the organisers can renew the air display aspect, to that of previous years, then Kemble as an air show venue, may survive. 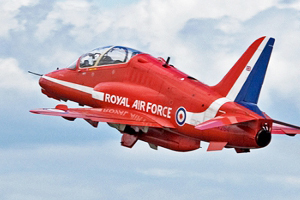 Given that this is the first time the new format has applied, let us allow them the time to plan next year’s event and see whether the air display component is to remain a major plank in the structure or whether we are seeing the demise of air display flying at the Red Arrows’ “spiritual home”.